Helps saves time and energy:- Stainless steel pressure cooker as with every other pressure cooker saves time and energy as they are efficient compared to conventional cook pots. Since stainless steel material conducts and retains heat efficiently, you will be able to achieve suitable results within a short time this saving more time in your cooking. Stainless steel pressure cookers are easy to clean:- Generally, stainless steel material is resistant to scuff marks and smudges and therefore doesn’t absorb dirt making it easy to clean. When pressure cooking with a stainless steel cooker, you can rest assured that spills will not stick and cleaning is as easy as it could be. You can use your cooker for many years without losing the shiny and sleek look. Stainless steel guarantees longevity:- Unlike aluminum and other materials, stainless steel is rust-proof and does not corrode. It also does not discolor or fade and therefore has a long life span. The pressure cookers can endure tough and hot conditions in the kitchen and outlast other materials by many years. Stainless steel pressure cookers offer healthy results:- The material is hygienic and therefore you can cook your food without fearing about the change of taste. In addition to the fact that the material does not harbor germs and dirt your food retains its natural flavor and quality. Stainless steel material does not react with food during the process of cooking and therefore you are assured of healthy results. Stainless steel is scratch resistant:- This high quality material does not easily scratch when washing or cooking and therefore retains its perfect aesthetic look. The material also does not stain and remains sparkling clean throughout its lifespan. Stainless steel pressure cookers are non-porous:- This means it does not harbor germs and bacteria as compared to other materials. This means washing them does not require much effort and storing them after cleaning is easy with a little bit of wiping and disinfectant cleaning. A stainless steel pressure cooker can be used on different cooking surfaces including ceramic, electric and charcoal among others. Have uniform heat distribution:- Stainless steel cookers have a uniform heat distribution that makes cooking even. Your food cooks evenly something ever cook will appreciate. A stainless steel pressure cooker can easily fit in any kitchen as they perfectly complement the theme and the design in the kitchen. 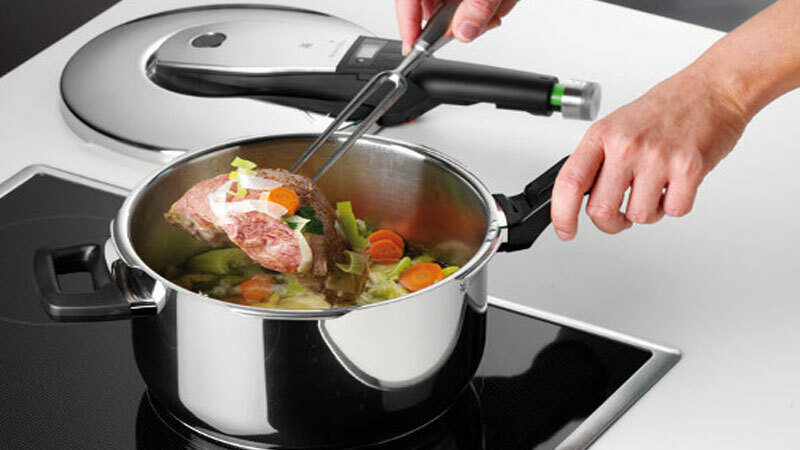 The Kuhn Rikon Duromatic Pressure Cooker well in any kitchen. Although it is a little bit expensive compared to aluminum pressure cookers, the stainless steel compensates this by offering a longer life span and quality services.